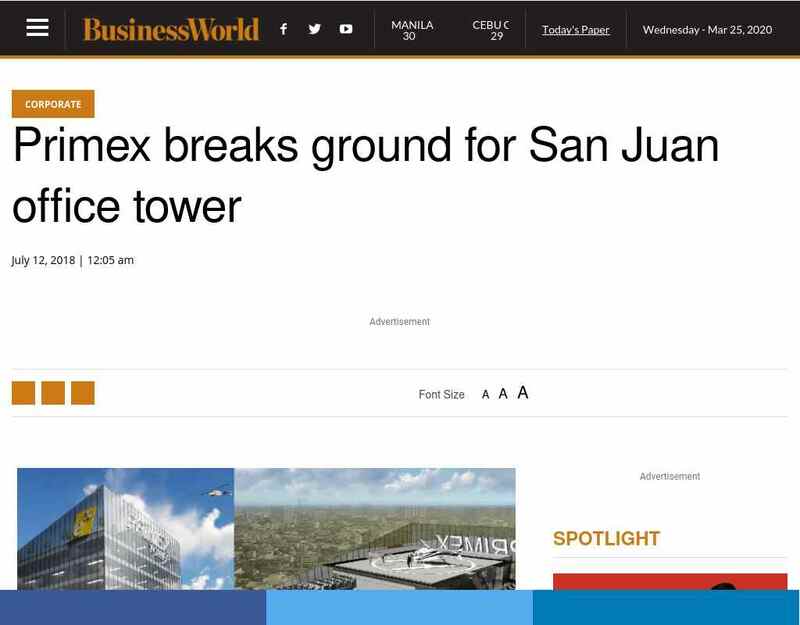 "..PRIMEX Corp. started the construction of its P3.6-billion office tower in San Juan City yesterday, banking on its prime location to drive demand for tenants. In a statement issued Wednesday, the listed property developer said it has broken ground for the ..."
"..PRIMEX Corp. started the construction of its P3.6-billion ... Mr. Ang said a study made by real estate consultancy firm Colliers International Philippines had projected an average 10% per annum increase in rental rates across submarkets." "..Mr. Ang said a study made by real estate consultancy firm Colliers International Philippines had projected ... conditioning system in the building. LEED standards are measures imposed by the United States Green Building Council to ensure that a development ..."